Spring Break - A Time for Recharging: I hope that all of you had a restful and recharging spring break. I stayed around town and continued to nurse our previously flooded basement back to health, work, catch some of our son's track meets, and visit locally with some friends and relatives. I also spent one day in New York City at Microsoft headquarters working with developers and other superintendents from around the country as we spoke about how to get more creative in how we educate students. The most impressive part of that trip was how I was treated when I arrived at Microsoft. They took my drivers license and scanned it to make me a visitor's tag. A very nice woman then told me that elevator D would be available to take me to the fifth floor. I proceeded to the bank of elevators and one of them lit up with the letter "D" on it. The doors opened and I stepped inside. There were no buttons. A digital display read "5". The doors closed and up I went. Pretty cool! 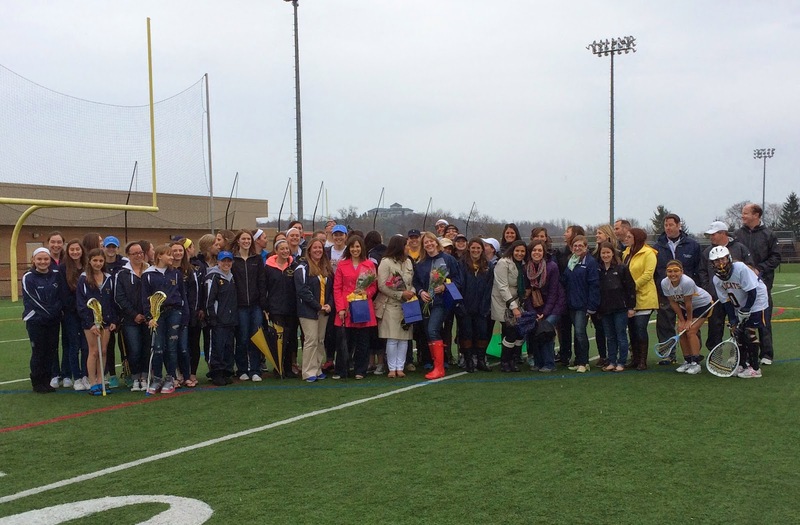 Celebrating 20 Years of Girls Lacrosse at West Genny: This year marks the 20th anniversary of the creation of our women's lacrosse program at West Genesee. On Saturday something special happened on the turf field when we honored the three women who were bold enough as young ladies to try out for and make the boys lacrosse team (Kathleen O'Shea Barter, Kristin St. Mary Barber, and Lisa Pisegna Tyszka). They were so good on the boys team that they were responsible for the creation of a girls club team, JV team, and a varsity team. We often talk about the success of the boys lacrosse program, but thanks to Kathleen, Kristin, and Lisa, hundreds of female athletes have gone on to play lacrosse in high school and college which provided opportunities that they would not have had were it not for these pioneers who were honored. (They are pictured with many of those alumni, along with current JV and Varsity lacrosse players.) On top of this celebration, our wildcats played an incredible game against a top opponent and won in double overtime! The End of School is Closer than you Think: Today officially begins the beginning of the end of the school year and before we know it, the end of June will be here. The Junior Prom is coming up on Saturday night, we are inching closer to sectionals for spring sports, and Kaleidoscope plans are in full swing. I will even begin to sign diplomas. DON'T BLINK! I hope that each of you had an opportunity to spend at least a few minutes of the weekend outdoors. The weatherman indicates that the temperatures and sunshine that we experienced was a bit of a tease, but the real deal is not far around the corner. 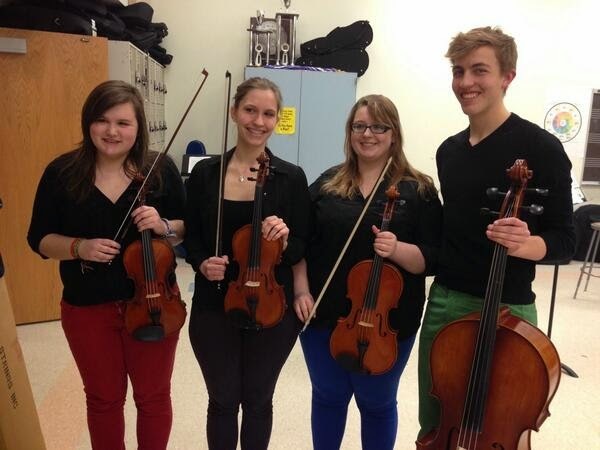 Such Talented Students and Staff: Last week was pretty cool. The organizers of the High School Talent Show asked some of us adults to put something together for the students. 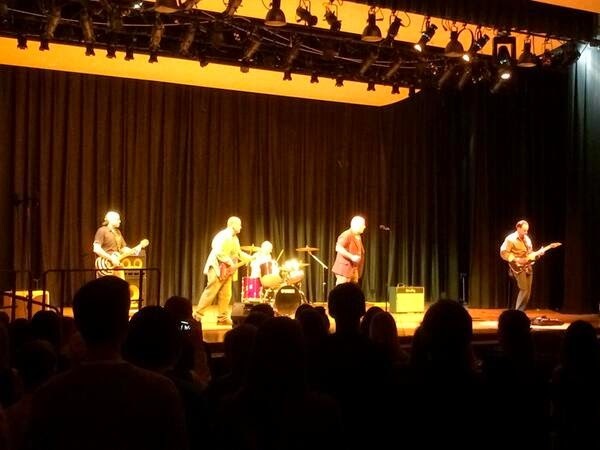 Music teachers Bill Mercer and Mike Stachnik, along with Career and Technical Education teacher Steve Ficarra, Assistant Superintendent for Curriculum and Instruction Brian Kesel and I blasted out Smells Like Teen Spirit from the 1990's band Nirvana. When we hit the first few notes it sounded and looked like shock coming from the crowd. However, as Mr. Kesel belted out the lyrics and the music loudly supported it, the shock turned into excitement and it was cool to see the reaction from the students at the end! 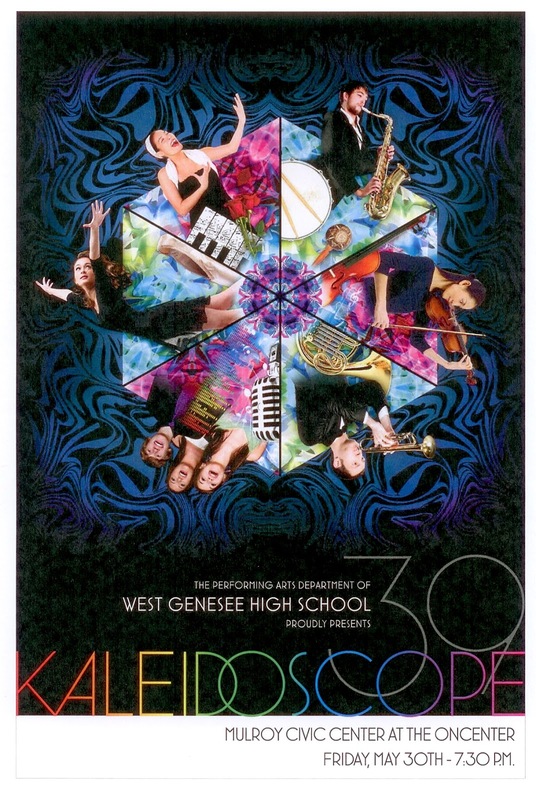 We were fortunate that we pulled it off because West Genesee has so much talent that as each act performed, it became pretty clear that we had to really do well! I would like to thank the organizers of the talent show, ALL of the performers, the students and the parents for allowing a group of middle aged guys to have a quick mid-life crisis. If anyone has a video (we have seen a few very short clips) we would love to see it. Thanks again! There was also an art show at the high school on Thursday night that was just incredible. It was challenging to select a favorite because the pieces were all so good! 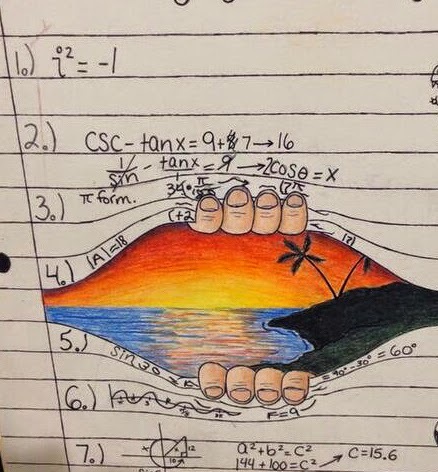 As a former math teacher, I had a special attachment to a drawing of a math paper with two hands pulling at the middle to show an island paradise. 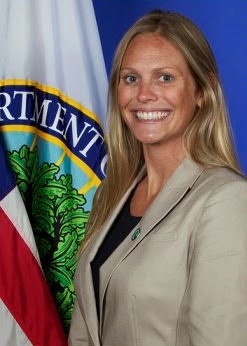 Listening Session with U.S Department of Education: On Friday we had an opportunity to meet with Emily Davis who is a representative from the United States Department of Education as Teaching Ambassador Fellow. She first listened to a group of administrators and then a group of teachers about what is working and what needs improvement in terms of Federal mandates and initiatives. Much of the conversation centered around Race to the Top, the Common Core Learning Standards, and Title Grants. I felt that the time spent was worthwhile, and I believe that each of us felt heard. 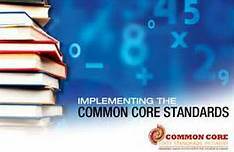 It was refreshing to hear that the Common Core is being implemented much more efficiently in other states. This made me feel better because I have been and still am very supportive of the Common Core Learning Standards. It is the roll out at the state level that I have issues with. From a Federal perspective, they were interested to hear how we dealt with a rushed implementation, and how we are moving forward today. I believe that we have some great examples because it is possible that we could receive a formal visit from Federal officials after spring break, and I could be traveling to Washington, D.C. soon to help as well. Time for me to put my money where my mouth is and use my voice to help make a difference on the largest stage. A short but busy week ahead. I am not going away for break so I can get caught up from this crazy school year. That being said, I am going to take a one week break from this blog. The next time I will post will be the Monday we return. Enjoy the week and the break! Assessment Update: Last week schools across New York State administered the English Language Arts (ELA) assessment for grades 3-8. As was widely publicized, many parents refused to let their children take this assessment for a variety of reasons that I outlined in my previous blog. I also mentioned the magic 95%. This is the percentage of students taking the exam for the entire district, school, and subgroup of students to continue to make "Adequate Yearly Progress" and therefore remain a school in good standing. I tried to make sure that people were at least informed that if a school, district, or subgroup were to fall below the 95% participation rate, then the school district could be financially penalized at the end of next year. My belief is that falling below the 95% subjects us to penalties, yet the people making the rules at the State Education Department feel nothing. It is for this reason that I asked parents to really consider all of the variables before excluding their child(ren) from the state assessment. Low and behold, enough parents must have refused to have their child take the assessment because late Friday it was announced that we would now be allowed to take a complicated average of last year's participation percentage and this year's participation. To me this is just pushing the problem out another year. I am sure that to NYSED they feel that if they can drop some schools off of the "below 95%" list, that the negative voices will subside and things will just move along. I am here to tell them that things will not "move along" until they admit what they have messed up, and allow people who actually know what they are doing to create a plan to mop up this current mess and fix things moving forward. I expect us to be above the 95% participation rate, but my voice concerning this is going to get louder and louder with the Commissioner until changes are made. Participating with Students in Government: On the positive side, I had an awesome opportunity to visit with our twelfth graders who are taking Participation in Government. I enjoyed talking with them about student rights, social media, their paths to graduation, and a host of other topics that were driven by the students. I always appreciate this time to be with our seniors as they begin to make plans for life after high school. Mark Your Calendars for Budget Vote on May 20: With the state budget in place, we are happy and fortunate to be putting the finishing touches on our financial plan as we inch closer to May 20. Our budget meets all of the requirements set forth by the governor to give taxpayers a rebate (he has not announced all of the details yet) as long as the taxing entities are below their allowable tax caps (we are). The additional state aid we received left us about $70,000 short of our initial goal, but we have had enough retirements to close that gap. We are in the third year of a five year fiscal plan that has worked really well for us. This summer we will work on a plan extension so that we never find ourselves scrambling. College and Career Ready: As college and career opportunities have changed over the past couple of years, we are preparing a three year high school plan. One additional emphasis will be on increasing our high school completion rate (which is currently at 93% and working our way to 100%). Another is to create alternate pathways to graduation (using project based learning, coops, and internships to name a few ideas), and continue to build an environment where every student challenges themselves to take at least one college level course before they graduate. This will be exciting work. Is it Finally Spring? Looks like some decent weather ahead, which we can really use. 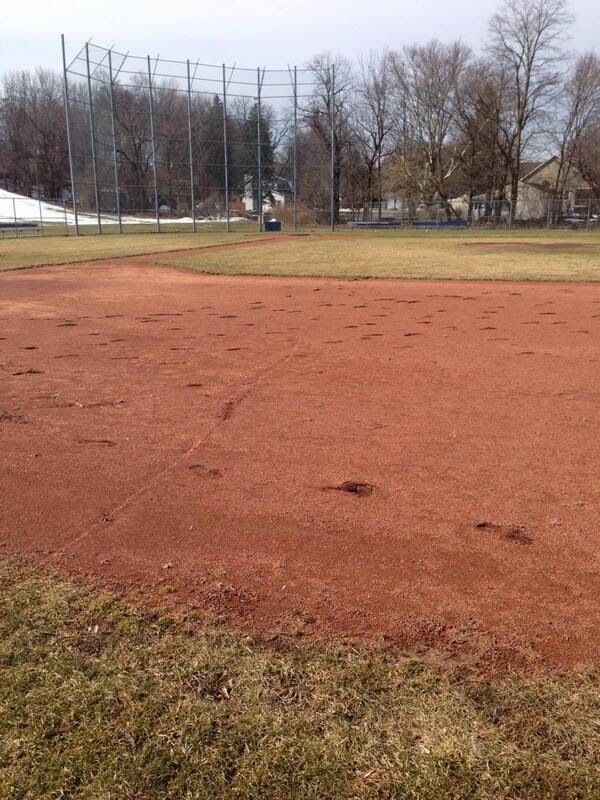 If you are attending a school function at one of our fields or facilities, please know that we have identified all of the areas that might need a little "TLC" after the brutal winter. There are areas of heaving, pot holes, drainage issues, and mud. Once the ground completely thaws, we will make quick work of these areas and our facilities will look as nice as they always do. By now you have probably heard that the English Language Arts (ELA) Assessment was given in grades 3-8 across New York State. You may have also heard that some parents chose to have their children refuse to take this assessment. the rush to test on these standards even though the material is still being rolled out to students. I certainly have strong opinions about how flawed the implementation of the Common Core has been, as well as how quickly New York State chose to test on the standards compared to other states. I doubt I would be writing this blog had those two things been done with more common sense. In my job, however, I am always forced to put my emotions aside and make decisions that are in the best interests of students, staff, and taxpayers. These decisions are based on the information that I have at the time, any history that might be relevant, and any rules, laws, or regulations that might apply. Parenting, in my humble opinion, is THE most challenging and rewarding job we could ever have, and I never judge a parent when they make a decision regarding their child. I also do not think we know how we do as parents until they have had a chance to take what we taught them and live on their own. Parents can also become stressed when we must make decisions for our children, even when we assist them with a decision. Sound like fun all of you non-parents out there?!? 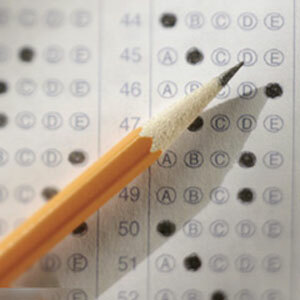 The facts surrounding test refusals is complicated. In the most simplest form, and with the information that is in play today, schools across New York State could lose funding based on the total percentage of students who do not take the New York State Assessments. The "magic" percentage that school districts as a whole, as well as individual buildings, need to maintain their "good standing" status is 95% , and that percentage is calculated several different ways. This percentage is one of the factors in determining if a school or district has made "Adequate Yearly Progress". 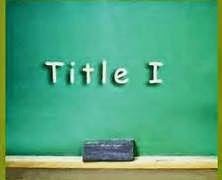 In a nutshell, if a school, building, or sub-group of a student population falls below the 95% participation rate, a mechanism could be enacted where Federal funds that a school receives, called Title I funds, might need to be diverted. They would then cover the costs of an outside company to provide tutoring to students, but ONLY for those students who receive free and reduced lunch (no matter what their score is). Still with me? The impact of this would have a domino effect because most schools, including West Genesee, use these Title I funds to help cover teacher salaries for students who truly do struggle. Diverting these funds creates a budget gap that eventually winds up in the general fund and schools either have to cut to close that gap, or raise taxes to supplement that gap. ALL of our students and ALL of our employees could be impacted. In my opinion, no matter what negative impact this has for a school or a district, those who created this structure and these plans move forward with no repercussions. To me, this scenario qualifies as a "lose/lose". There are more factors that I have not included in this blog, but I wanted you to have some basic information. Ninety-seven students refused to take the ELA Assessment at West Genesee, which is 4.43% of our school wide population who were eligible to take the assessment. We will not know if individual buildings or sub groups are below the 95% until later this spring and after the testing windows (the Math Assessments take place in May). If we fall below the 95%, our clock starts ticking and the financial impact will be felt at the end of next year unless a waiver is introduced, and I have not heard any buzz about that as of yet. Again, we are not alone. However, I wanted to make the point that there can be true and unintended consequences for decisions we make once emotion is removed.